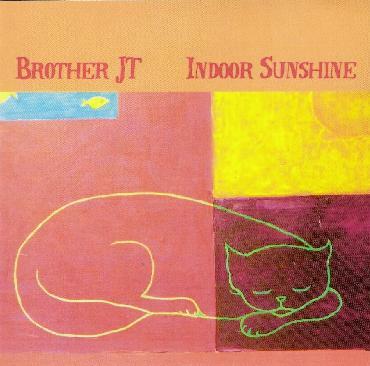 Brother JT - "Indoor Sunshine"
Brother JT's Indoor Sunshine has indeed been, for me, the perfect antidote for cold winter days, but I imagine it will go down just as easy on warm summer afternoons. The title track sets the mood, with a deep and spacey eastern vibe, followed quickly by the breezy acoustic guitars of Warm's the New Cool. Rubbin' Off is like being lost in a haze of incense with it's shimmering buzz of electric noise drones and swirling guitar melodies. Then there's the strange, sludgy weirdness of Sweden, relieved by the dreamy, early Floyd-like Very Beautiful, complete with softly strumming acoustic guitars and a sighing electric slide guitar as it builds with more layers of guitar and something that sounds like glockenspiel into a beautiful sonic web. Well, you get the idea. Those are just descriptions of the first few songs. Brother JT recognizes the value of a good drone, even in a pop song, and uses the technique to great effect. But like any good psychedelic musician, his palette is filled with numerous colors, as touches of intriguing and sometimes exotic instruments swirl in and out of the mix. He also masterfully layers numerous guitar tracks, each with their own distinctive sound to create beautiful complex tapestries of sound in his music. His vocals are upfront and raw, bringing sincerity to the music through its personal approach; you feel like JT is right there in your room, singing to you. The album ends with a quiet, moving and beautifully spacey rendition of a traditional spiritual piece, Wondrous Love, leaving the listener to just lay there and absorb the sunshine. Creative playing, warm and freaky sounds, and bright compositions abound on Indoor Sunshine. Get the incense burning and enjoy! For more information you can visit the Brother JT web site at: http://www.brotherjt.com. Visit the Heavy Records web site at: http://www.heavygrecords.com.